How Long Do Inquiries and Bad Credit Stay On Your Report? You’ve always been so careful, but now there’s a bit of bad credit on your report. The first thing you likely want to know is how long that new dark spot will stay there. And if you check your score, will that inquiry sit on your report? If so, how long will that be on there? How long do inquiries and bad credit stay on your report? Well, it depends. Inquiries stay on your credit report for two years. But, the good news is, they only impact your score for the first year. And that’s only if it’s a hard inquiry, which is when a lender pulls your report to check your credit for an application. Some examples are when you apply for an auto loan, mortgage or credit card. Keep in mind, though, each of the applications will count as a separate inquiry. What about soft inquiries? These are inquiries that are not being reviewed by a lender. Instead, they are when you check your own credit, credit check made by businesses to offer you goods or services, or when a business you already have an account with checks your score. It’s good to know, however, that inquiries don’t account for much in the overall breakdown of what makes up your FICO score. But, seeing as they do still somewhat impact your score, here’s some further reading on how many hard inquiries affect your credit score. Most negative information will remain on your credit report for seven years, although there are exceptions. This information stays on your report for seven years from the date it was first reported as late. If the account is closed, the entire account will be removed after those seven years. However, if the account remains open, the negative information will be removed, but the account will remain on the report past the seven years. Collection accounts remain on your report seven years, plus 180 days from the date the account was delinquent leading up to when it was placed for collection. After this time, it must be removed. This is regardless of when it was paid or placed for collection. Want to know more about how many points will a collection affect your credit score? Chapter 7, 11 and 12 bankruptcies remain on your report for 10 years from the date they were filed. Chapter 13 bankruptcies are a bit different. They can stay on your report for up to 10 years, but often times reporting agencies will take them off seven years after the filing date. Check out this page for more information on what happens to your credit when you file for bankruptcy. Tax liens can very negatively affect your score, especially if you don’t pay them off. They remain on your report for seven years from the date filed, but will stay indefinitely if not paid. Lastly, paid judgments can remain on your report for seven years from the date they were filed. However, if unpaid, they can either stay for seven years or the governing statute of limitation, whichever is longer. 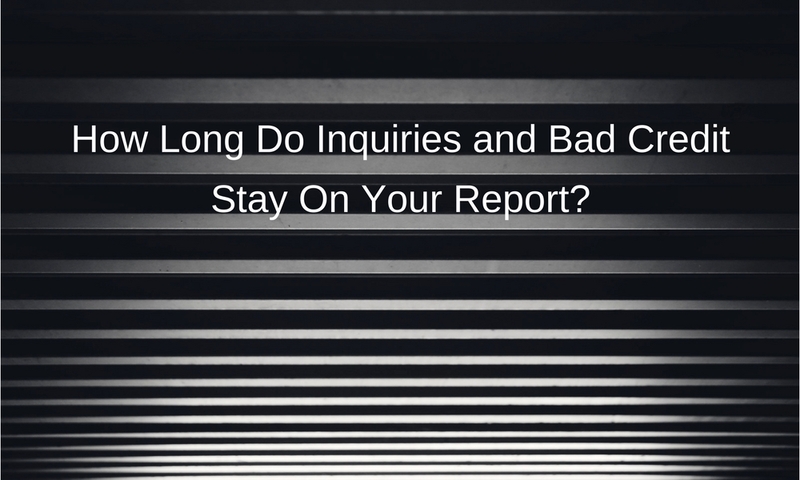 Want to know more about how long inquiries and bad credit stay on your report? Let us know! To enlist the help of a trustworthy, effective credit repair company, call us today at 1-866-991-4885! ← Do I Have To Go Into Debt To Get Good Credit?